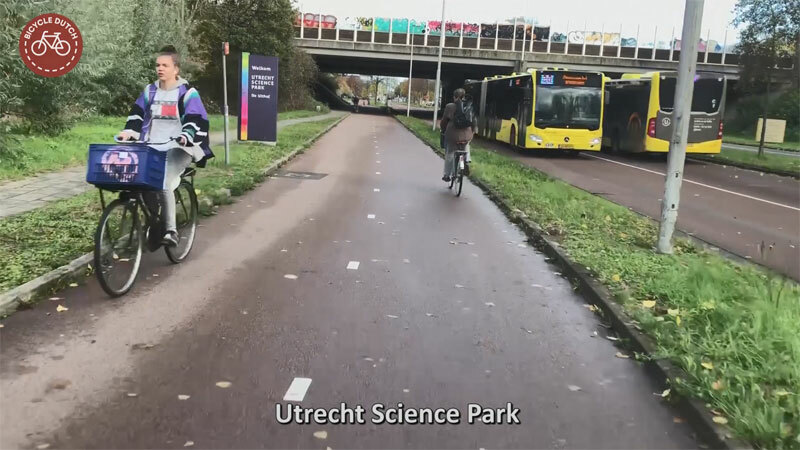 Utrecht has improved the cycle route from Overvecht in the north of the city to the University campus Utrecht Science Park. This means that people could choose to arrive at the train station Utrecht Overvecht and continue their journey on a bicycle from there (and not from the busy central station), but it also means that students living in the huge student housing complex near Overvecht can cycle more easily to the University. The existing part of the route is used very well. 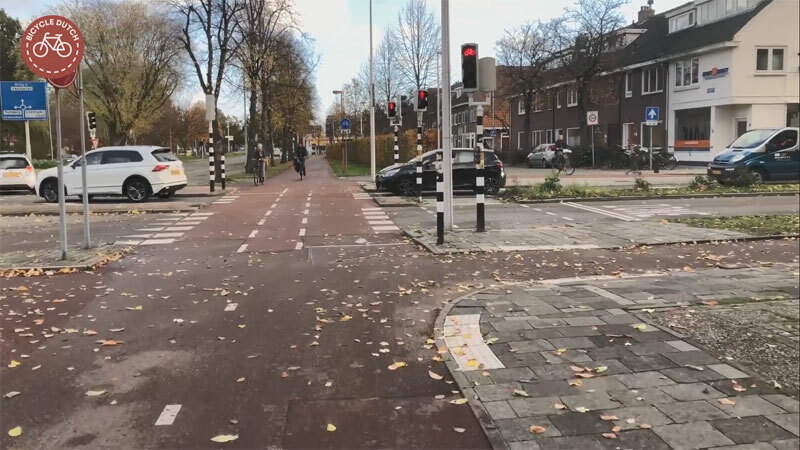 The cycleways on the protected intersection of Kardinaal de Jongweg (Utrecht’s ring road) and Mr. Tripkade were widened and they are now bi-directional. That means you can go through this intersection clockwise (“against traffic”) or anti-clockwise (the usual way) depending on which traffic light is green first. It is clear that the city took the opportunity to do a number of things in these streets, now that the surface was temporarily removed, such as replacing the sewer pipes, that are not directly connected to the cycle route. The route also didn’t have to be redesigned from beginning to end: at the so-called bear pit (a grade separated intersection from the 1940s) the new part of the route connects to an existing high quality route from there to the university. 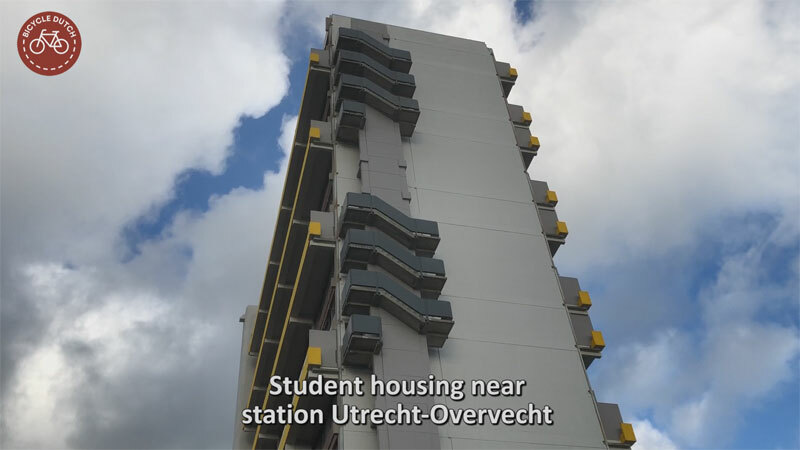 I began my ride at the 1970s student housing apartment buildings, not at Station-Overvecht. The route still has a lot of traffic lights, I added those to the map. 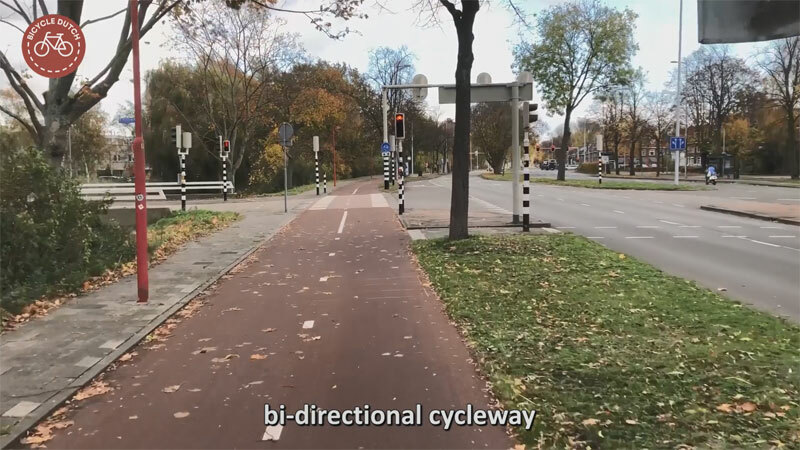 These bi-directional cycleways already existed. Nothing needed to be changed here. This is a new cycle street. This used to be a traffic calmed residential street. The speed is 30 km/h now and due to the exit constructions of the side-streets (eg. to the right in the foreground) traffic entering this cycle street has to give the right of way. Some of the existing cycleways were widened, such as at this intersection. The elephant’s feet (the white blocks) should have been on the outside of the crossing. Now they optically narrow the cycle ways and that is not what the latest manuals recommend. Fresh new red asphalt around the fuel station in the route. 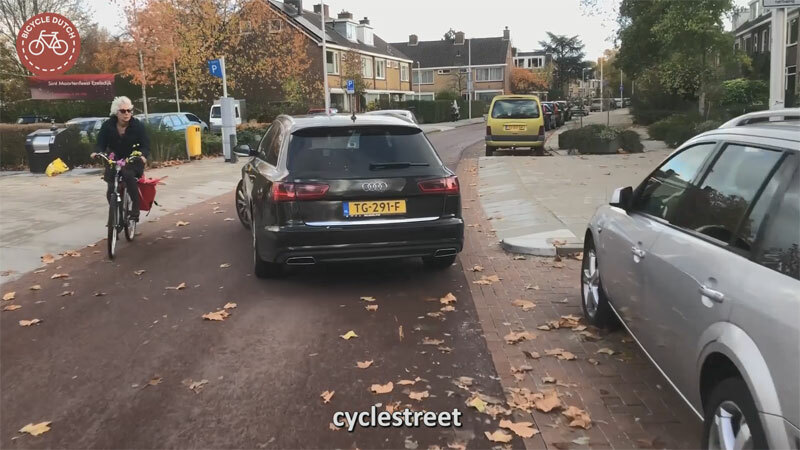 Unfortunately some drivers park on cycle streets where it is not allowed, such as the driver of the car in this picture. At this location the cycleway transforms from the cycle street in the foreground to a cycleway to the left. You can see that the surface of red asphalt is continued on the cycle route. The street turns to a surface of red brick. This makes it easier to follow the course of the cycle route. The cycleways on this intersection were widened but the lines on the black asphalt were not yet completely redone. You can see some older blocks (elephant’s feet) that have been replaced by lines. That is because the cycle route has to give way to cars now (in case the traffic lights do not function) whereas in the before situation the cycleway was considered to be on a roundabout with priority. Another new cycle street. You can see that there are strips of bricks on either side of the red asphalt. That is to make the street wide enough for motor traffic but as the same time it looks narrower than it is to reduce the speeds. There was some criticism that this cycle street is too busy. In rush hour it serves as a rat run. 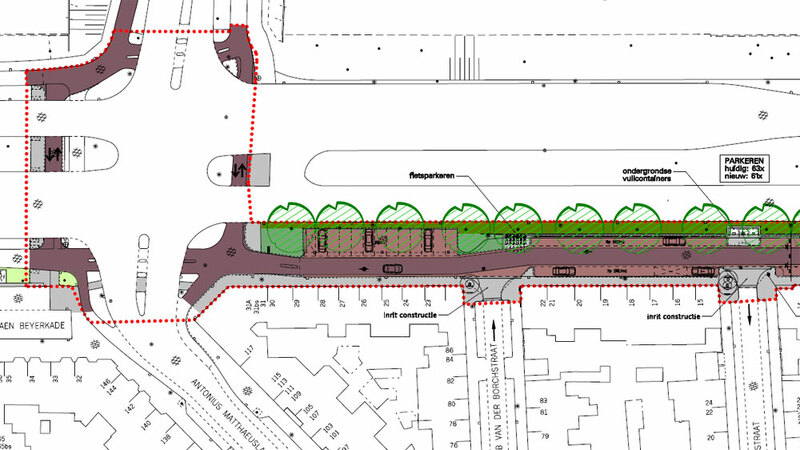 It is against all recommendations that the street can even be used as a short cut to reach a main through car route, that should not be the case for a cycle street. 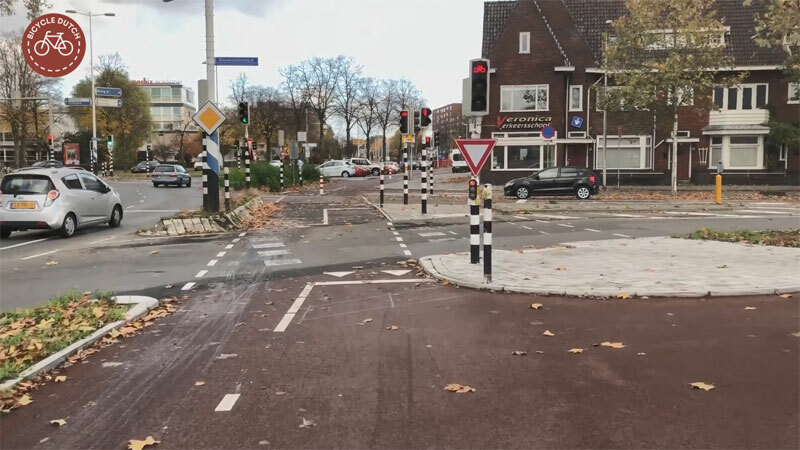 This T-junction of cycleways is the connection of the new cycle street in Karel Doormanlaan to the cycleways of Biltstraat near the Berekuil. It was improved to handle an increased cycle traffic volume. I wonder if the bollards are really necessary though… From this location to the university the route already existed. No further changes were needed beyond this point. At the edge of the Utrecht Science Park there is a sign welcoming you. This part of the route already existed. 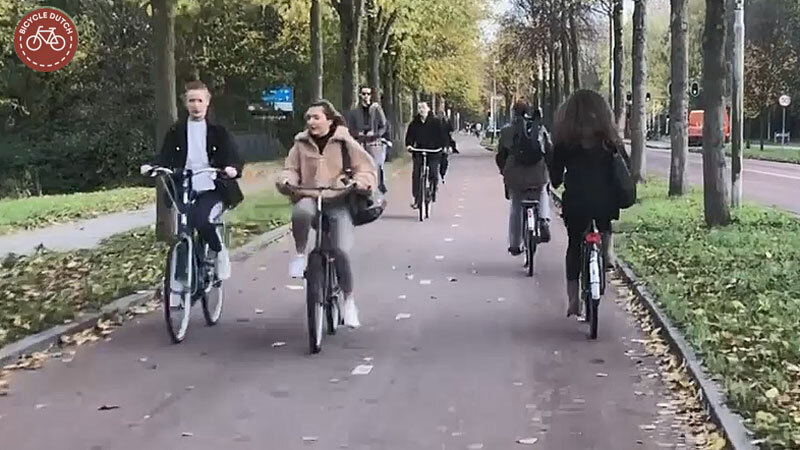 This week’s video: the improved cycle route from Overvecht to Utrecht University. There is about 80 metres of route missing in Jan van Galenstraat. That may seem odd but it has a logical reason. That entire street will be redesigned soon. It was impossible to redesign only the first 80 metres now and then the rest later (due to pipes and cables for instance). So that entire street will be redesigned all at the same time in the near future. 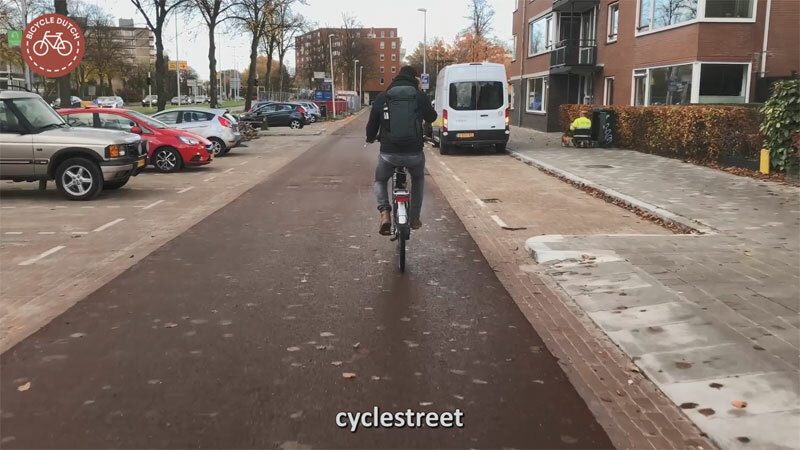 Most of the information for this post came from the website of the city of Utrecht, but those pages were removed after the project was finished. Only a letter to the council is still on the internet in PDF (and in Dutch) with most of the same information. Close the city for motor bikes and mopets! The rationale for this plan was the actual modal split for traffic between Overvecht and de Uithof. That suggested a high number of potential cyclists. 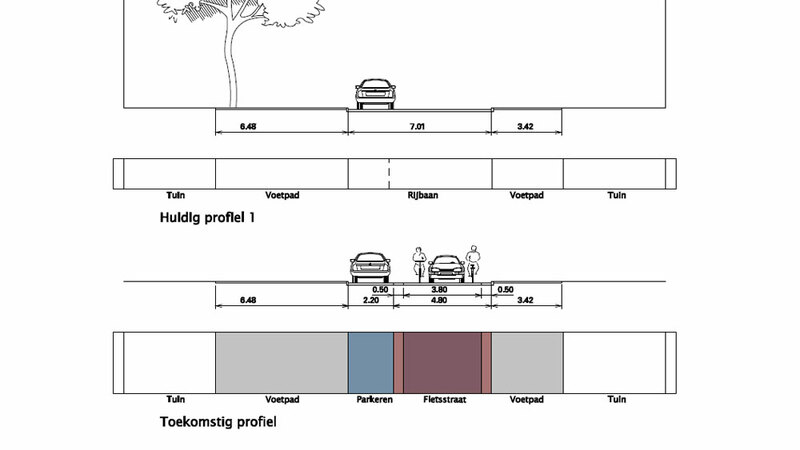 There was a small advisory committee on behalf of the Fietsersbond during the design phase. I was one of them. The actual building was (again) a disastrous process. Two parts were broken open and left as is for months because of winter (two succeding winter seasons). Due to extremely poor scheduling the Van Esveldstraat got a temporary brick surface. That took three months (summer holidays). After just three weeks it was closed again for sewer repairs. That took another three months. Alternative routes were poorly organised or impossible to even more major road works. 3:14 In the reverse direction the light of cars is problematic. The side of the bike path is invisible during winter. 4:09 Cyclists have right of way here. But a lot of automobilists ignore this and even block the path completely. 5:46 This bollard is unnecessary and right-out dangerous. In morning rush hour it is invisible due to the number of cyclists starting all at once at the traffic light. 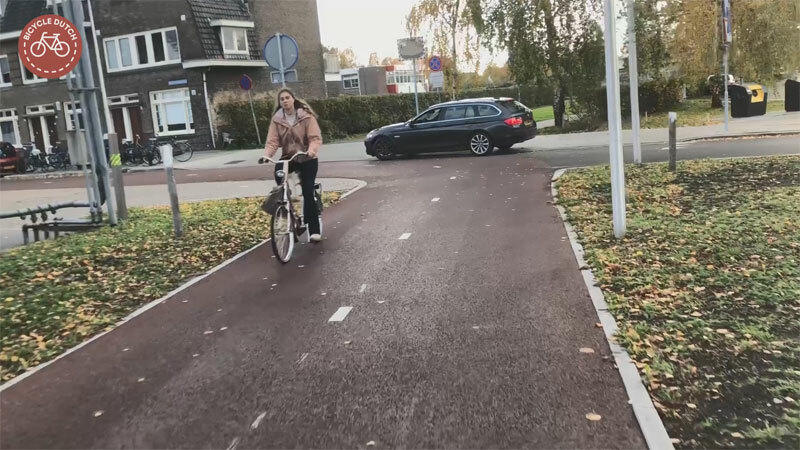 Moreover, at the same time they meet with cyclists coming from the left, manouvring through that narrow space, using their attention to avoid that **** bollard. 6:46 Had two accidents here and numerous near accidents with cyclists coming illegally from the opposite direction. 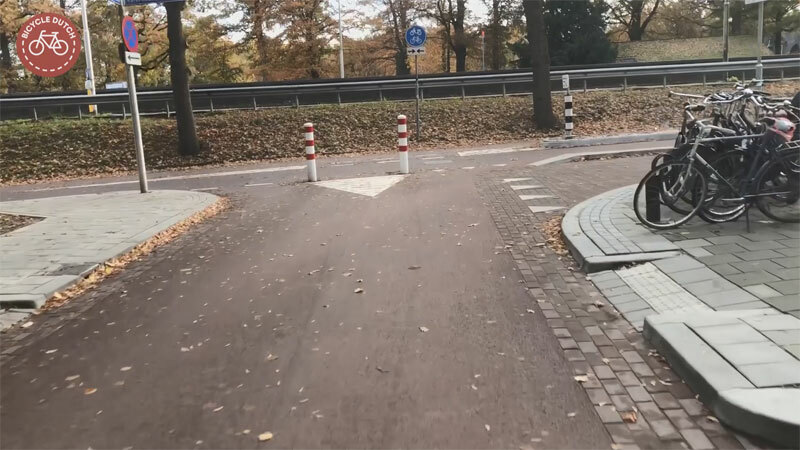 The designers could not find a good solution for this junction. Due to time pressure (fundings had to be used on short notice) it was left as is. 8:10 Cars coming from the same direction leave the major road system (at 6:46) and go left here to reinsert into the major car infrastucture. This morning all five cars on the Huizingalaan were doing that during my journey. They clog up the narrow road due to one single car and some cyclist from the opposite direction. 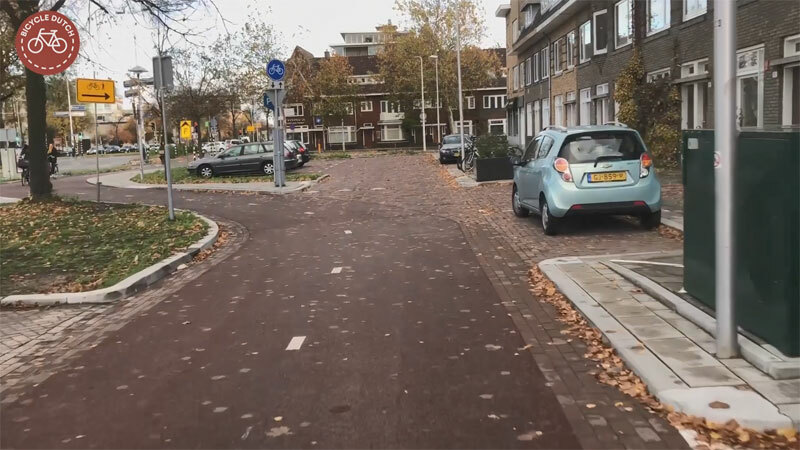 This rat-run traffic should not be allowed on a ‘fietsstraat’ by design. And especially these drivers are mostly the most agressive too. How trim and healthy most people there look. Where I live in the US most people are overweight, bloated and unhealthy looking. I doubt most could bicycle 5 kms without taking a break. That is if they could even get on the bicycle at all! 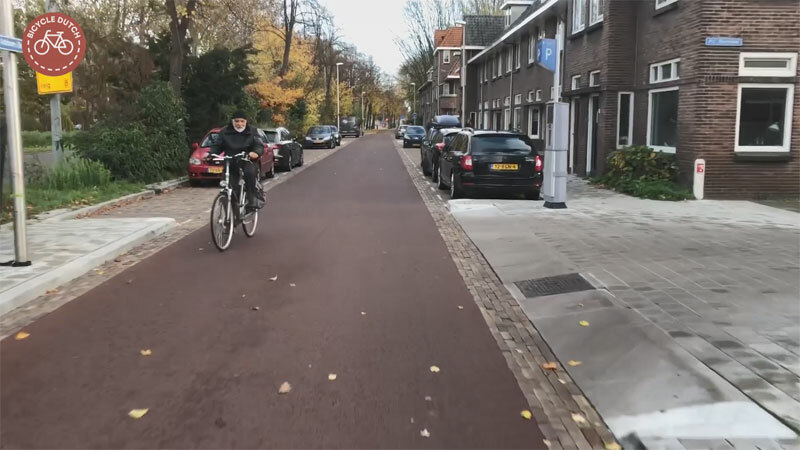 This entry was posted on 27 March 2019 by Bicycle Dutch in Original posts and tagged cycle paths, cycle streets (Fietsstraat), long distance cycle paths, Utrecht.